The User Story Mapping template helps agile release planning, ensuring structure to the backlog driven by business benefits. 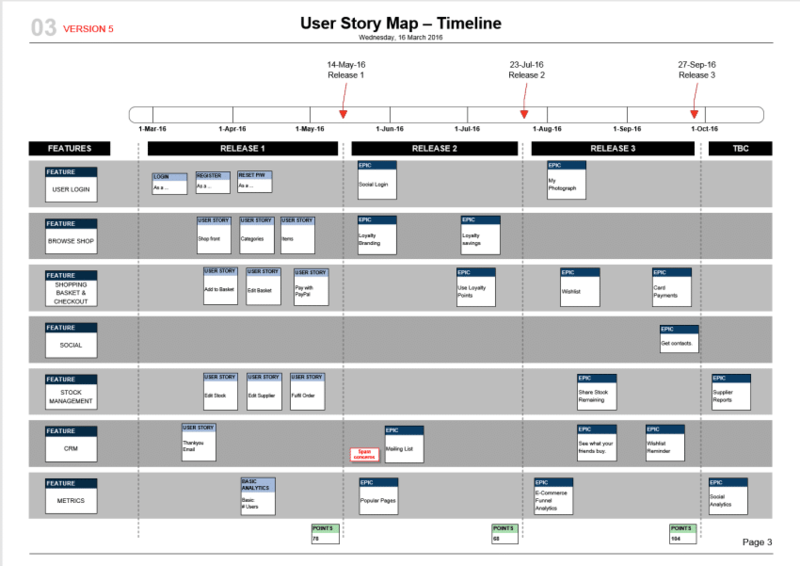 The User Story Map is a useful agile release planning tool. It ensures delivery of a viable, useful product with clear business benefits for each release. It is often used to reach an MVP plan. FORMAT 1: User Story Mapping with 3 Releases + Icebox. User Story Map Template – 3 Releases Plus Icebox. 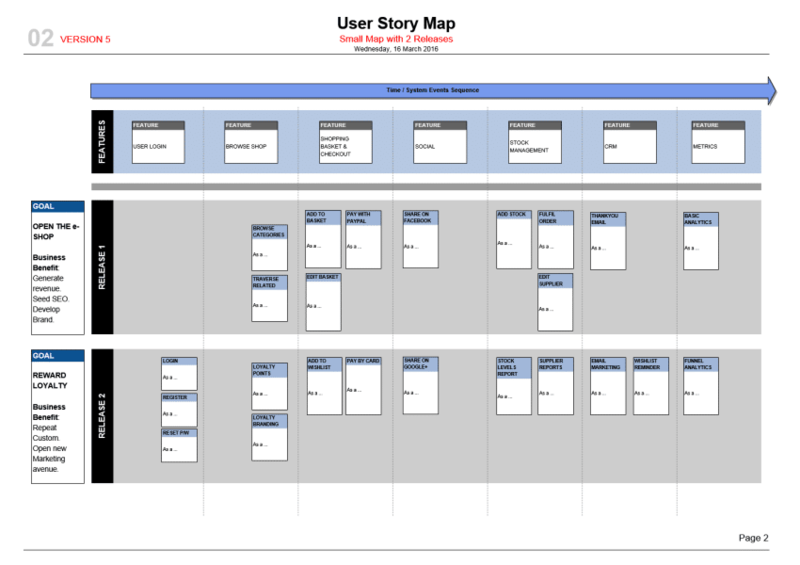 User Story Map Template – 2 Releases. Features Row – The “Backbone”. A User Story Map arranges the high level features across the top. These can be “Feature” or “EPIC” items. The Features are in order of system events, or in order of sequence of use by the end user. This row of features across the top forms the structure to the Story Map. Releases – GOAL & User Stories row. GOAL – area to define the Goal of Release 1. Containing the essential user stories for each Feature or EPIC which deliver to that Goal. but do not deliver to the business goals of Releases 1-3. Rating for User Story Map Template (Visio) Template: 4.6 out of 5 , based on 6 customer reviews. Show how your resources are allocated on your Project Timeline. This Agile Resource Plan Template shows resource allocation and investment in a Roadmap format. 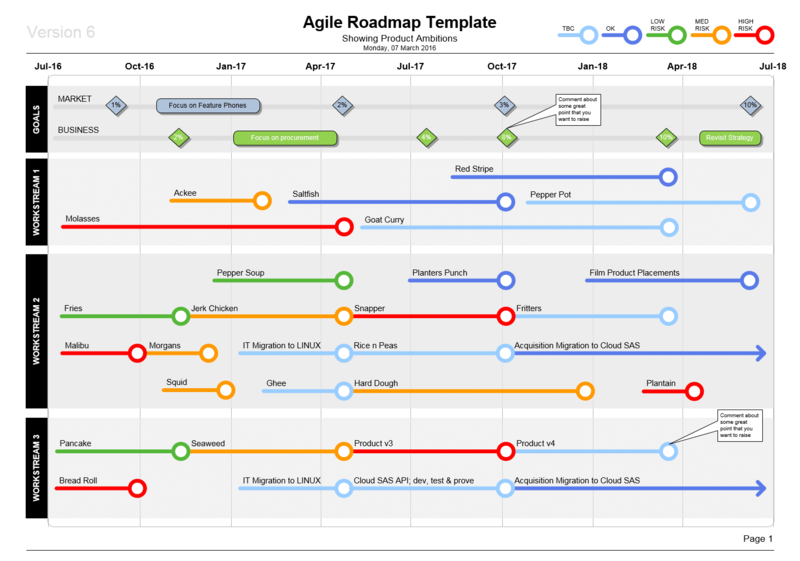 This stylish Visio Agile Roadmap shows your Product Plans over time, It includes Workstreams, milestones, KPIs, and stylish graphics. Loved by many. The Agile Release Plan Template allows you to show your Agile Programme Plan featuring EPICs and THEMEs, with Release Dates. Especially useful for Scrum teams in a portfolio. This template explains the story mapping process and provides templates so that you can create your User Story Map and your Agile Release Plan. This Visio Agile Release Plan Template is designed to help Scrum Teams coordinate Product MVP release planning. Uses a Story Mapping method for MVP focus. How do I create an Agile Project Release Plan? Save more than 70% on this bundle of premium graphical formats for Project and Product managers. Show your team plans, risk levels, timings, resources, milestones in these appealing project diagrams. Get a bundle of our most popular Visio Roadmap & Agile Templates at a massive discount. Enjoy amazed expressions at your meetings!